Holds 60 Tapes. In very good condition. RARE MUSIC CASSETTE TAPE HOLDER BLACK VINYL CARRY CASE HANDLE HOLDS 42 CASSETTES WORKING PERFECTLY AND COMES WITH THE PLASTIC CASSETTE HOLDER INSERT. WILL BE SENT BOXED VIA HERMES FOR A TRACKED DELIVERY SERVICE. Made of black vinyl. Holds up to 57 audio cassettes. Size is approx 35.8 across x 21.8 cm tall x 12 cm deep. View images to see the tapes. Just needs a a goad soapy cloth to clean. They are not original tapes, just pre-recorded. Retro WHSmith Faux Leather Cassette Case With Lock & Key. Holds 15 Cassettes. Retro WHSmith Faux Leather Cassette Case With Lock and key. Condition is Used, but very good. The case holds 15 cassette tapes and expands forwards for looking at the tapes. VINTAGE POLYDOR SINGLE STORAGE HAS DESCRIPTION "TANZ UND UNTERHALTUNG" WHICH TRANSLATED AS "DANCE AND ENTERTAINMENT" Condition is Used. Dispatched with Royal Mail 2nd Class. Compact size makes this jewelry case convenient for travel. RETRO ORIGINAL, IR HAS A GRAMOPHONE LOGO ON THE FRONT, UNSURE IF OFFICIAL. LP 12" STORAGE BOX. EXCELLENT CONDITION. VERY SOLID BOX. BLACK FAUX LEATHER VINTAGE 70's VINYL RECORD LP 12" STORAGE BOX / CARRY CASE Useable condition. Lots of tape removal marks and light damage to covering, oxidisation to clasps and handle - please see photos. Clasps are fully functional. Complete with key. Holds approx 50 records. A LOVELY LOOKING LARGE DEEP TWO TONE BROWN FAUX LEATHER 12" LP CASE. IT HAS A GOOD RETRO 1970'S LOOK AND IDEAL FOR LARGE RECORD COLLECTION. Circa 1970s, as I bought it in 1973. Black pin striped vinyl record storage box for 7" singles. Key included. good condition - small split on seam at side - see last picture. Cream faux leather snakeskin effect 12" Vinyl record carry case. Both catches work and lock both keys supplied. 13 1/2" Wide x 13" High x 7 1/2" Deep (when closed). RECORD CASE FAB 60'S-70'S ORIGINAL LP CASES CHOICE OF COLOURS ! FAB 60'S - 70'S ORIGINAL LP CASES IN BLACK /BLUE /LIGHT weight STRIPEY/SALMON RED IN EXCELLENT CONDITION. HOLDS APPROX 35 ALBUMS. BUY IT NOW ! Vintage Retro Cassette Tape Storage Case Carrier & Tapes. Condition is Used. Previously owned by a smoker so requires freshening up! Dispatched with Royal Mail 2nd Class. Red plastic/faux leather lockable audio cassette carry case for 20 cassettes. SLIMLINE RED CASE HAS SMALL 1" TEAR TO TOP OF LID, ODD SCUFF MARK CONSUMMATE WITH AGE. A LARGE DEEP RETRO 1970'S GREEN DOUBLE LOCKING 12" LP RECORD CASE. LOCKABLE, WITH KEY SUPPLIED ,A REALLY NICE LARGE SIZE STRONG ONE. Retro Faux Leather Crocodile Skin LP Record Case. Excellent, hardly used condition. The faux leather is still shiny and soft. Only minor rust on the locks. Has a small mark on the front as shown on the picture. A LARGE DEEP RETRO 1970'S TURQUOISE DOUBLE LOCKING 12" LP RECORD CASE. CASE LOGIC CD WALLET. Koskin wallet holds 24 CDs or 12 CDs with liner notes. delicate CD surface. Protective padded Koskin cover has the look and feel of leather. Brass / Silver Twist Catch in good working order. ORIGINAL 60's/70's 7" RECORD STORAGE BOX / CARRY CASE 20-30 singles. Black shiny vinyl (patent leather look)/ Light grey matt. 1960's or 1970's 7" single storage / carry case. For Sale Very Elegance Mediatote CD DVD Storage Wallet 208 Cd/Dvd Capacity .Never Used. Condition is New. Dispatched with Royal Mail 2nd Class. It's a sturdy red Leatherette box with a fold over lid and a drop down side piece. It has 2 gold lockable locks on the lid and a carry handle. It still has the original 2 keys attached and the locks still work fine. A LARGE DEEP RETRO 1970'S RED DOUBLE LOCKING 12" LP RECORD CASE. IDEAL FOR LARGE LP COLLECTION. The inside lining has split at the top crease where it opens, but generally it's in excellent condition. Fabric: Koskin. CASELOGIC32 KOSKINCD/DVD WALLET. Carry and protect your CDs in style! The case is made of durable nylon with thick foam padding for maximum protection. Double-sided black ProSleeves protect delicate CD surface. Compatible for Sony MDR 7506 MDR V6 MDR CD900ST Audio technica ATH SX1. 2 Pcs Ear Cushion Pads for Sony MDR 7506 MDR V6 MDR CD900ST Audio technica ATH SX1. Leather Ear Cushion Pads for Sony MDR V7506 MDR V6 High quality Black. 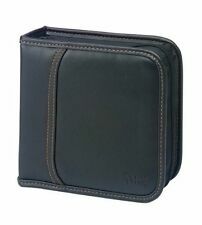 Compact Data CD/DVD carrying wallet for 12 discs. Faux Leather outer. 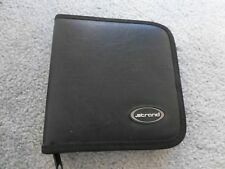 CD / DVD Storage Case/Bag. 28 sleeves with each sleeve holding 8 discs (4 each side). Expandable - can add sleeves as required. 14" x 12" x 4" / 35cm x 30.5cm x 10cm. 12" vinyl record LP carry case storage locking. Condition is Used. There are some marks as per the photos. There is a slight tear on the back and a scratch on the front. It is lockable and keys are included along with the original record index. It has been in my attic since the eighties. One of the black holders has a tiny bit of wear on the plastic in side & the other one is a bit hard to close as the plastic folds in. Auction is for two cases. Each case holds 96 CDs. Used condition, so usual wear and tear marks. No damage ,zips working. handles pushes in for flat storage. I have another two cases in a separate listing. Smoke free home. Large cream storage box, with a lid and handle on front of box. The box has a fabric lining. The exterior is a faux leather effect. The box is in excellent condition, collection only from Notting Hill. Vintage Mock Croc Record 12" LP Storage Carry Case Box Vinyl Album Brown Retro. Condition is Used. Some wear and tear as pictured - this item is around 59 years old so as expected, no key but it still opens and closes fine. Sold as pictured. Dispatched with Royal Mail 2nd Class. Very solid and a rare finish, really stunning.